Reading and share top 12 famous quotes and sayings about Pledge Of Allegiance by famous authors and people. 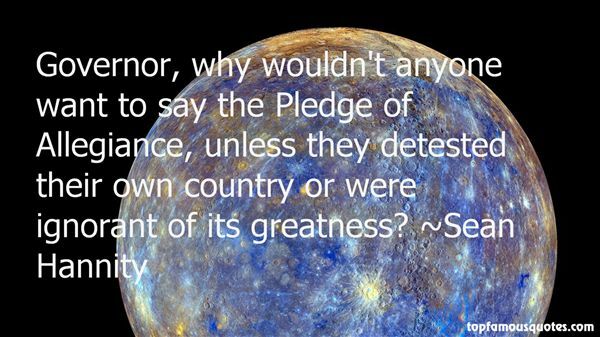 Browse top 12 famous quotes and sayings about Pledge Of Allegiance by most favorite authors. 1. "In his heart of hearts, I am sure, he couldn't wait to say the Pledge of Allegiance. I asked him what did it - the opulence, the abundance, the sheer self-satisfaction of the rich? "Actually," he said, "it was the ham." 2. "I'd like to thank William the conqueror for the Normandy Conquest. Because of him I've been speaking French every time I say the pledge of allegiance on D-day." 3. "Then she moved backwards, deeper into the shadow. All I could see was that she was barely there, like something you almost recall: the Pledge of Allegiance, your daddy's real name." 4. "You don't want atheism shoved down your throat? OK. We will stock knocking on doors spreading our ‘Truth,' and having tax-exempt organizations dedicated to atheism that have influential political action committees. We will also stop printing ‘In atheism we trust' on all US currency and saying, ‘One nation, under atheism" in the pledge of allegiance. We will also stop insisting that everyone who disagrees with us will be sentence to eternal damnation… Wait…"
5. "Let's do more than say the 'Pledge of Allegiance.' Let us live it!" 6. "What struck me as I began to study history was how nationalist fervor--inculcated from childhood on by pledges of allegiance, national anthems, flags waving and rhetoric blowing--permeated the educational systems of all countries, including our own. I wonder now how the foreign policies of the United States would look if we wiped out the national boundaries of the world, at least in our minds, and thought of all children everywhere as our own. 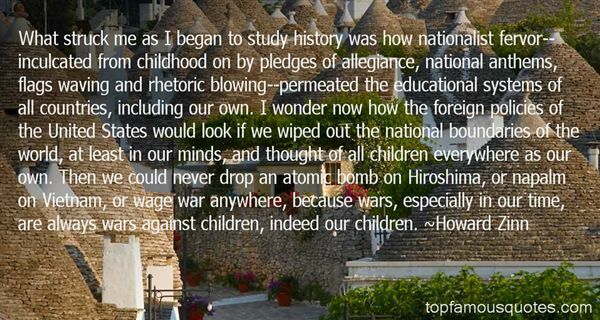 Then we could never drop an atomic bomb on Hiroshima, or napalm on Vietnam, or wage war anywhere, because wars, especially in our time, are always wars against children, indeed our children." 7. "With hurricanes, tornados, fires out of control, mud slides,flooding, severe thunderstorms tearing up the country from oneend to another, and with the threat of bird flu and terroristattacks, "Are we sure this is a good time to take God out ofthe Pledge of Allegiance?" 8. "You only trust those who are absolutely like yourself, those who have signed a pledge of allegiance to this particular identity." 9. "These were the kids who would take LSD for recreational purposes, who relied upon tape recorders to supply the weird studio effects their music required and who could repeat the cosmic wisdom of the Space Brothers as if it were the Pledge of Allegiance. Brought up on space heroes and super beings, as revealed to them in comic books and TV shows, the whole galaxy was their birthright, just as Mad magazine and cheap B-movies had shown them hows stupid and flimsy a construct daily life could be. To the subtle dismay of their parents, this was a generation capable of thinking the unthinkable as a matter of course. That their grand cosmological adventure should come to an end just as Neil Armstrong succeeded in bringing Suburbia to the Moon is another story and it will have to wait for another time." 10. "I do not go to church. I don't go to Christian church or Jew church or any other church. I don't go to church at all. Not ever. A perfect Sunday for me is spent drinking green tea while reading the Sunday New York Times. Yikes! Why don't I just turn in my Al-Qaeda membership form and call it a day? 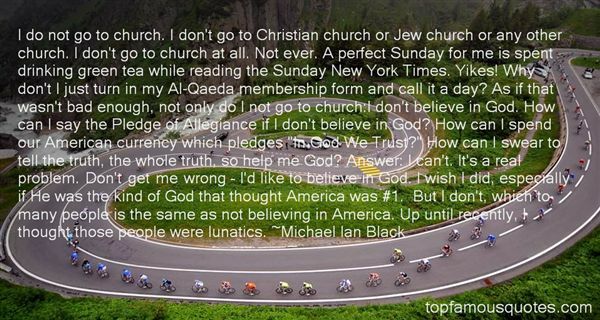 As if that wasn't bad enough, not only do I not go to church:I don't believe in God. How can I say the Pledge of Allegiance if I don't believe in God? How can I spend our American currency which pledges "In God We Trust?" How can I swear to tell the truth, the whole truth, so help me God? Answer: I can't. It's a real problem. Don't get me wrong – I'd like to believe in God. I wish I did, especially if He was the kind of God that thought America was #1. But I don't, which to many people is the same as not believing in America. Up until recently, I thought those people were lunatics." 11. "The Pledge of Allegiance reflects the truth that faith in God has played a significant role in America since the days of the founding of our country." 12. "Governor, why wouldn't anyone want to say the Pledge of Allegiance, unless they detested their own country or were ignorant of its greatness?" To live means to finesse the processes to which one is subjugated."